Some U.S. research has found that roasting cashews appears to increase the antioxidant activity in these delicious nuts – as well as making them more tasty, in my opinion! However, roasting them was also found to decrease the amount of flavenols in the nuts, chemical substances that are helpful in preventing heart disease (such as those found in red wine). Just goes to show that research is a mixed bag and that most food preparation methods will have good and bad effects on the food we eat! Cashew nuts contain an array of healthy vitamins and mineral; vitamin K (good for bone health and immunity) as well as the minerals magnesium (good for healthy blood supply to the nerves and brain), copper (good for brain function and involved in the break down of fats in the blood) and zinc (helps fight infection by preventing bacterial colonisation). 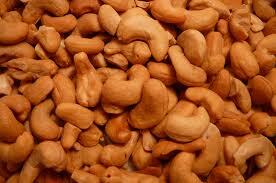 Cashew nuts also have a good array of healthy fatty acids to keep cholesterol levels normal and blood vessels healthy. We do need to be aware that, although these are healthy, unsaturated fats, they still mean that cashews are high in energy (calories) so portion control is advisable. Carry on with a balanced, varied diet high in vegetables and fruit, containing fibre (18-24g/day), sources of low fat dairy, starchy carbohydrate (55%), protein (15%) and some healthy fats (25% max) and you can’t go far wrong.